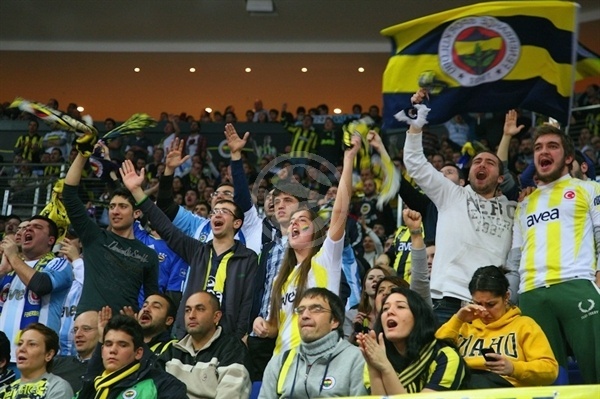 Panathinaikos BC Athens took a pivotal showdown in Top 16 Group G by downing Fenerbahce Ulker 56-77 in front of almost 12,000 fans in Istanbul, Turkey on Thursday. Panathinaikos improved to 2-1 and will qualify to the Turkish Airlines Euroleague Playoffs if it beats FB Ulker next week and Unics downed EA7 Emporio Armani Milano. FB Ulker dropped to 1-2 and may need a road win against the Greens to stay in the playoffs race. Kostas Kaimakoglou paced the winners with 19 points - a new Top 16 career high. 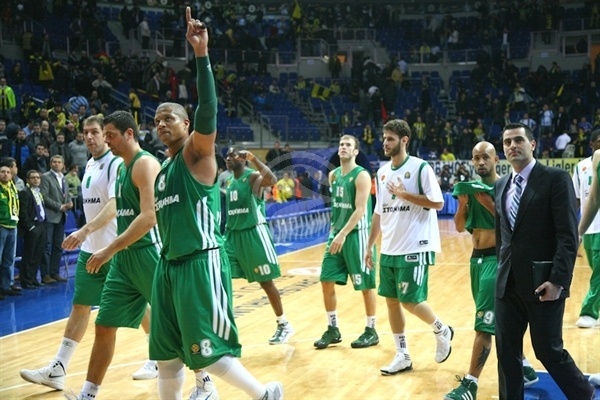 Mike Batiste added 15 while Romain Sato had 12 for Panathinaikos. Curtis Jerrells led FB Ulker with 12 points. Roko Ukic added 11 while Kaya Peker had 10 for the hosts. Batiste had 10 points in a 2-15 opening run and Kaimakoglou took over late in the first quarter to make Panathinaikos get a 9-24 margin after 10 minutes. A three-point play bu Ian Vougioukas soon gave Panathinaikos its biggest margin, 13-32. FB Ulker against to get within 34-45 midway through the third quarter but Sato and Dimitris Diamantidis stepped up to restore a 43-58 lead after three quarters, enough for Panathinaikos to keep full control of the game until the final buzzer. FB Ulker coach Neven Spahija changed his team's starting lineup to use Bojan Bogdanovic and Emir Preldzic at the wings. Batiste got Panathinaikos going with a jump hook that Peker erased with a long jumper. Batiste scored around the basket and added a tip-in to give the Greens a 2-6 edge. FB Ulker struggled to score for more than three minutes. Meanwhile, Kaimakoglou followed a jump hook with a three-pointer that forced the hosts to call timeout at 2-11. 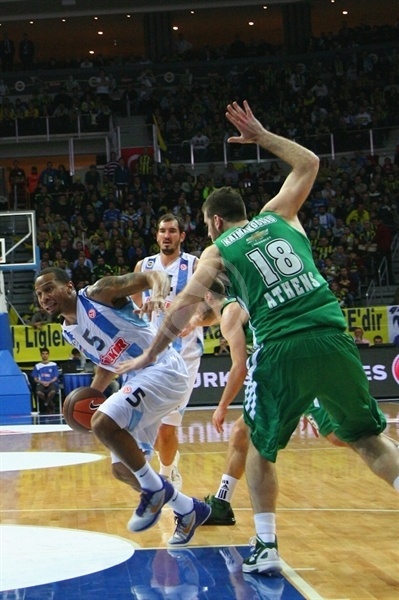 Batiste buried a five-meter jumper, as the Greens' defense forced FB Ulker to miss 10 consecutive shots. Batiste scored in the low post to cap a 0-13 run. The hosts had been scoreless for almost six minutes before Ukic made free throws. Jerrells added a driving layup to get to 6-16. Kostas Tsartsaris hit a jump hook that Bogdanovic bettered with a triple. Kaimakoglou took over with back-to-back shots from downtown to boost Panathinaikos's lead to 9-24 after 10 minutes. Sato buried a step-back jumper early in the second quarter, good for a 9-26 Panathinaikos lead. FB Ulker tried twin point guards - with Jerrells and Engin Atsur together on court - to improve its ball circulation. Jerrells hit a baseline jumper, which Tsartsaris bettered with an off-balance three-point play. Omer Onan tried to change things with a fast break layup, but even when FB Ulker improved its defense, a layup-plus-foul by Ian Vougioukas made it a 19-point game, 13-32. Atsur nailed a triple and fed Peker for a layup that made Panathinaikos call timeout at 18-32. Sato and Peker traded free throws, as the Greens tried to feed Batiste in the low post. Kaimakoglou hit foul shots and the Greens readjusted their defense to avoid open looks. FB Ulker was held scoreless for almost three minutes until Peker hit a floater in the lane, but it only brought the hosts within 22-36 at halftime. Sato took over with a tip-in soon after the break but Ukic erased it with a driving basket and James Gist added a three-pointer to get the crowd involved at 27-38. Nick Calathes answered from downtown and fed Dimitris Diamantidis for a fast break layup, good for a 27-43 Panathinaikos margin. Peker scored down low and FB Ulker found a go-to guy in Jerrells, who followed a long jumper with a three-pointer to bring his team within 34-45. The guests did not panic, however, as Batiste and Sato made free throws to give the Greens some fresh air at 34-49. Jerrells kept pacing FB Ulker with a layup-plus-foul that Sarunas Jasikevicius matched with his trademark three-pointer from the top of the key. Sato made free throws that Preldzic bettered with a triple but Kaimakoglou restored a 41-55 Panathinaikos margin. A fast break layup by Ukic and a three-pointer by Diamantidis fixed the score at 43-58 after 30 minutes. 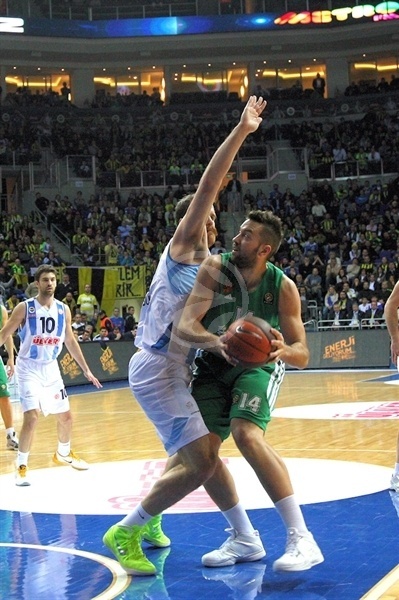 Oguz Savas scored down low early in the fourth quarter, as FB Ulker tried Preldzic at point forward. Gist soon scored in transition to bring the hosts within 47-58. 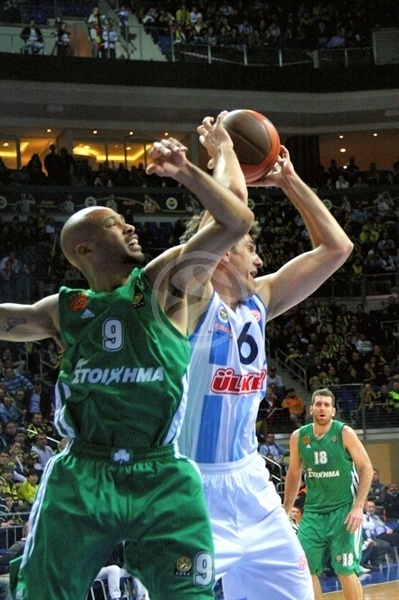 Batiste made free throws and a long jumper by Sato kept Panathinaikos way out of trouble, 47-62, with 8 minutes to go. The Greens kept full control through an outstanding Diamantidis, who kept controlling the game tempo. David Logan stepped up with an acrobatic fast break layup that made FB Ulker stop the game at 47-64. Ukic banked in a running shot off a timeout and even when Logan scored again, a jumper by Mirsad Turkcan and a three-pointer by Ukic gave FB Ulker some hope, 54-66, with 3 minutes to go. Kaimakoglou downed a three-pointer and a fast break layup by Logan sealed the outcome, 56-71. A reverse layup by Logan and free throws by Kaimakoglou allowed Panathinaikos to cruise to a very important road win.